In the early morning of May 27th, it smelt of burning by Télégraphe [metro station]. 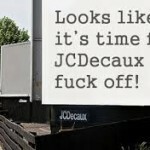 A JCDecaux van went up in smoke. They enrich themselves with the gentrification of cities and exploitation of convicts. Solidarity with comrades imprisoned during the Operation Piñata in Spain. Solidarity with Mónica and Francisco. Czech republic is a country of „political stability“. In despite of general disillusionment in capitalism no social movements haven’t emerged yet. Whereas in other countries social protests and demonstrations underway at least, in the Czech republic demonstrations against neoliberal austerity can be counted on the fingers of one hand. 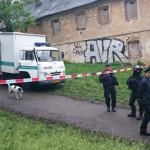 Moreover even the radical left, anarchist and anti-authoritarian activities were in decline after anti-IMF and anti-NATO summit protests at the beginning of 2000’s and squatting practically disappeared. Ours is a society in which, in every field, one group of people makes decisions, exercise control, limits choices, while the great majority have to accept these decisions, submit to this control and act within the limits of these externally imposed choices. Nowhere is this more evident than in the field of housing: one of those basic human needs which throughout history and all over the world people have satisfied as well as they could for themselves, using the materials what were at hand and their own, and their neighbors labor. The marvelously resourceful anonymous vernacular architecture of every part of the globe is a testimony to their skill, using timber, straw, grass, leaves, hides, stone, clay, bone, earth, mud sand even snow. Consider the igloo: maximum enclosure of space with minimum of labor. 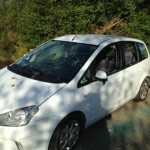 Cost of materials and transportation, nil. And all made of water. Nowadays, of course, the Eskimos live on welfare handouts in little northern slums. 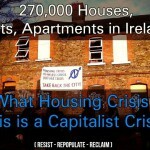 Man, as Habraken says “no longer houses himself: he is housed” – Colin Ward. Wednesday morning [April 29th], in Vigneux-de-Bretagne, three biologists from Angers who came to study marbled newt were chased off by a dozen masked individuals. 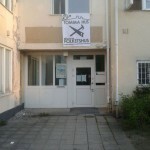 The Cibulka squat has been evicted today, four people are still in the tower, twelve have been already arrested according media report. More info to be posted as soon as possible. 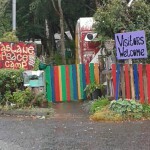 There’s a good crew at the Peace Camp just now, if we can be so pleased with ourselves. However, to be fully effective the camp needs greater numbers and wider support. For that reason, we’d like to organise a ‘bank’ of part-time Peace Campers, to help make sure all the boxes are ticked and afford greater ambition in campaigning at this critical time. The SqEK network of researchers and activists meets in Barcelona, Spain, May 21st to 25th, 2015. We present there an exhibition of posters and information presentations from and about autonomous spaces, from the squatting, occupation and disobedient movements. This show will go on to the USA in September. We call for posters and presentations to be sent by post (please contact for address), or by digital file so that we can print them out on site. 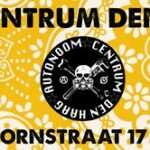 The Autonomous Center (AC) located at Willem van Outhoornstraat 17 in The Hague is being threatened with eviction. The AC has already been squatted for 5 years and provides space for such activities as a vegan folks-kitchen and the alternative bookstore Opstand. During the past 5 years, nights devoted to information, films, and debate have been organized, and there is also room for music and meetings. 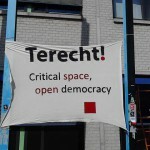 On the morning of April 30 the New University Nijmegen opened the critical café Terecht! at Radboud University. This space will be a place where students, teachers and support staff can come together and discuss the role of the university. The New University Nijmegen is a movement proposing for an open, critical university for everyone. It is part of a broader national and international movement of students and teachers. With the opening of Terecht! we hope to make a contribution to the recent debate about the place of the university in society.